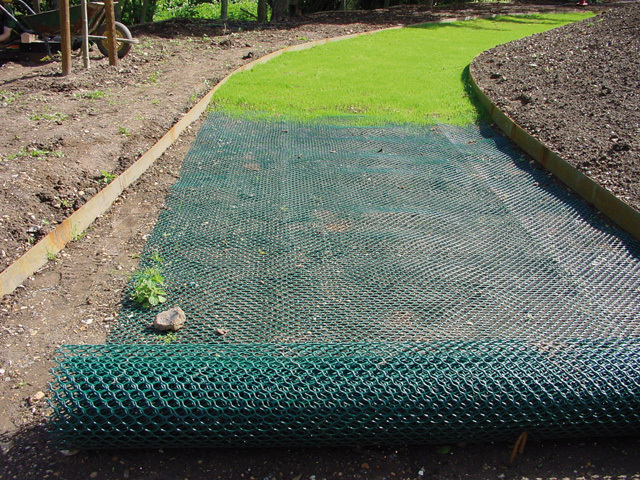 TurfProtecta™ turf reinforcement mesh is a strong extruded high-density polyethylene mesh. Supplied in 2m wide x 30m long rolls, it can provide excellent turf reinforcement if used and fixed as directed. Once fixed in place grass will grow through the mesh and may then be mown, rolled and fertilised as usual. When fully established (normally a full growing season will be required) the plastic mesh will be invisible and the turf will have a normal appearance. The intertwining of the grass roots with the mesh gives the turf the strength to resist light traffic and temporary car parking.